“Help! I can’t get up from the bottom of my tub. 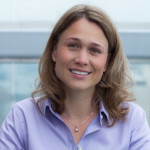 Is there something available that can help make it easier?” – Yes! If you have foregone a bath because you struggle to get up and down from the bottom of the bathtub, but you still long to enjoy the soothing benefits of soaking in a warm bath, then a bath chair lift could be the right solution for you. A bath lift is a piece of equipment designed to mechanically assist a user down into the bottom of the bathtub to enjoy a warm bath and raise the user back up again when they are finished bathing. Bath lifts are available in a multitude of different types and styles, some of which are designed to be installed on the wall, floor or ceiling, while others are portable models that do not require any installation. In this guide, we outline the different types of portable-style bath chair lifts, followed by a list of helpful criteria to take into consideration when deciding whether a portable bath lift is right for you. Portable bath lifts are available in four different types, which include: battery powered, water-powered, air-powered, and manual crank-style. As the name implies, this type of bath lift is powered by a battery and it resembles a chair. With the push of a button the lift is designed to lower you down into the warm bath water and with another push of a button raise you back up again. Most battery-powered bath lifts can perform somewhere between 4-20 lifts before needing to be recharged. Recharging is accomplished by detaching the battery from the lift and attaching it to a battery charger. The actual number of lifts that can be performed between charges will vary based on the bath lift model, user’s weight, and age of the battery. As a safety measure, most models are designed to prevent the chair from being lowered down unless there is enough charge for it to come back up again. Keep in mind, the bath lift’s seat will remain underneath you when the lift lowers you down and that the bath chair is not permanently attached to anything, so there is potential for it to wiggle a little when you sit down and stand up. Most (maybe all) models have suction cup feet that aid to secure the lift to smooth tub floors. Also be aware that the seat will hold you suspended a bit further forward in the tub, so if you are a tall user you should take into consideration that there will be less room to extend your legs. This type of bath lift has potential to work well for a person of average height, who is unable to independently get themselves up and down from the bathtub floor, yet still has sufficient balance skills to safely sit down on and stand up from the seat. Most models are designed to readily fit the width of standard-sized bath tubs. Some bath lifts are specially designed for use in wider, whirlpool style bathtubs. This type of bath lift has an air-inflatable cushion that is filled by a battery-powered air compressor. At the push of a button, the cushion deflates slowly lowering a user down to within a few centimeters of the bathtub floor and with another push of a button it re-inflates raising a user back up again. The cushion takes on average 3 minutes to fill. Most models are designed to prevent the unit from lowering a user unless there is sufficient battery charge to raise the user back up again. 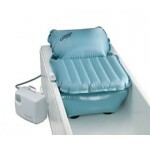 The air-inflatable bath lifts are able to achieve the lowest seat height of all the portable bath lifts on the market. Bath lifts of this type have potential to work well for a petite person of shorter stature. However, persons of taller stature, larger individuals, or person with severely compromised balance skills may find it difficult to stand up from because the seat has a soft, flexible surface and because the maximum height of the seat is relatively low. As the name implies, this type of lift is powered by the home’s water pressure. 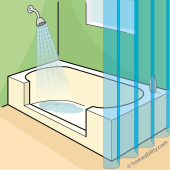 It gets attached to a shower pipe, diverter, or diverter spout and the water pressure acts to raise and lower the bath lift. A benefit is that you do not have to worry about recharging a battery. A drawback is that it will only work if there is sufficiently strong water pressure in your home. A crank is used to manually raise and lower this type of bath lift. The benefits are that no batteries or electricity are required and there is less likely to be a mechanical issue that might prevent the lift from raising you back up again after the bath is complete. The drawback is that it can take some patience and can be physically fatiguing to turn the crank the number of times required to successfully lower yourself down and then raise the seat back up again. What do you need to consider when selecting a bath lift? Minimum Achievable Height: The bath seat will remain underneath you when you arrive at the bottom of the tub. Of course, the lower the bath lift model will allow you to go, the more submerged you’ll be in the water. There are a few battery-powered bath chair lift models that can achieve a seat height of as low as 2.3 inches, with the air-inflatable models being able to achieve the lowest seat height of all of 2cm. Width: For a battery-operated bath chair lift, it is generally advisable to pick the widest bath lift your bathtub will accomodate. A seat that extends to meet the tub wall aids to create a bridge between the inside and outside of the tub, which in turn provides you with the option to sit down on the side of the seat prior to entering the tub. Then from a seated position, each leg can be lifted one at a time over the tub wall (eliminating the need to “step” in and out over the tub wall). Bath lifts can be found in seat widths ranging from 15.5” to 35.5”. Flaps (Wings): Many battery-powered bath lifts have flaps attached to the sides of the seat that are designed to extend out over the tub wall when the lift is at its fullest height. The flaps cover the open space between the seat and the tub wall, making it easier and safer to transfer on and off of the lift. 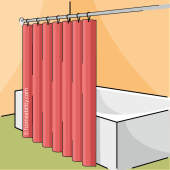 They are designed to fold upwards when the lift moves down to the narrower bottom of the tub. Frame Materials: A bath lift’s frame can be made of plastic, aluminum, or stainless steel, with the stainless steel models being the strongest. Upright vs. Reclining Back Rest: Some battery-powered bath lifts have a backrest that remains in a fixed upright position, some have a backrest that automatically reclines as the lift lowers down and some allow a user to independently control whether they recline or stay upright. The latter type are usually preferable because they support a user in sitting upright while washing or shaving legs and allow a user to recline back when ready to soak and relax. The versions that don’t recline at all claim to offer more legroom, potentially making them a better option for taller individuals. Swivel Seat (Rotating Disk): Some manufacturers offer a sliding and/or rotating disk, which can be added to the top of a bath lift seat. This accessory makes it easier to slide across the seat and/or turn your bottom as you lift your legs over the tub wall (if you opt to sit down on the side of the seat, prior to entering the tub). Seat Surface: Some bath lift seats are smooth, while others have a textured, slip-resistant surface. From a safety standpoint it is better to have a slip-resistant, slightly textured seat so you don’t slip off the seat. However, if you plan to sit down on the side of the seat first and then slide across the seat to arrive in the center of the tub you may find it is easier to accomplish this transfer when the bath seat’s surface is smooth. Suction Cups: Most bath lift models have suction cups attached to the bottom to help secure the lift to the floor of the tub, making it more stable. Be aware, the suction cups won’t work well (or at all) if your tub’s floor has a textured bottom. 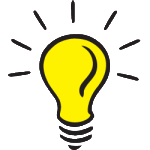 Safety Feature: Most chair lift models are designed to prevent the lift from lowering a user down to the bottom of the tub if there is not enough battery capacity to raise it back up again. Obviously, anything mechanical always has an inherent potential to fail, so it is wise to keep a portable phone in reaching distance when you are bathing — just in case. Accessories: Some models offer headrest attachments for taller individuals, chest straps and seat belts for individuals with poor sitting balance, wedges to prevent slipping forward or washable hygienic seat covers. Last but not least: We recommend to always check online to see if any complaints have been filed against a specific bath lift model, prior to making your final decision. A quick web search for the name of the model you are interested in along with the word “complaint” can help provide some leads to any publicly available negative user reports or experiences. Is a portable bath lift right for you? Transfer onto a seat that may wiggle a little when you get on and off. Remain seated upright while the lift lowers you down and raises you back up again. Is a Bath Chair Lift Safer Than a Walk-in Tub? The short answer is: Yes. People have found themselves trapped inside the classic-style walk-in tubs due to being unable to drain the water out. The water pressure inside the tub prevents an inward-opening door from being opened until the water leaves the tub. Rescuing people from walk-in tubs can be a hazardous endeavor for both for the individual and the EMT’s performing the rescue. Furthermore, a number of people have slipped off of walk-in tub seats and down into the footwell, where they were then unable to get back up by themselves. In some cases persons drowned before the EMTs were able to reach them. To learn more about what can go wrong when owning a walk-in tub, visit the article Walk-in Tubs: Buyers Beware! The likelihood of a drowning occurring as a result of a portable bath chair lift not raising someone back up, is nearly nil. In the unfortunate event you were to use a bath lift and it did not raise you back up as expected, your chance of finding a way to get yourself out of a standard bathtub, if need be, is still much higher than if you were to find yourself trapped inside a high-walled walk-in tub. And, if you were to require assistance to get out of the tub, as a general rule of thumb, it is much easier and safer for family members or EMT’s to rescue people from standard bathtubs than from walk-in tubs. Additional recommendations and safety tips can be found below. A bath lift can restore the ability to partake in warm baths again, but it is important to be aware that a bath lift is a mechanical device with moving parts, so there is always the inherent possibility that it might not function as it should. Therefore, we highly recommend that you plan to take a bath while others are in the home and/or to always keep a portable phone within reaching distance of the bathtub, so you can alert someone if you need assistance to get out of the tub. As note above, a portable-style bath lift is not permanently fixed to the wall or tub, so it may have a tendency to wiggle a little bit when you sit down and stand up. For more support, consider adding a grab bar on a nearby wall so you have a stable place to hold onto when sitting down and standing up. If you feel you do not have the skills to safely sit down on a seat that might wiggle a little, we recommend to visit the guide Getting In & Out of the Bathtub to learn about other bathing alternatives. We have adressed the portable, battery operated-style bath lifts in this guide. To learn about bath lifts that are installed on the floor, wall or ceiling, click here.